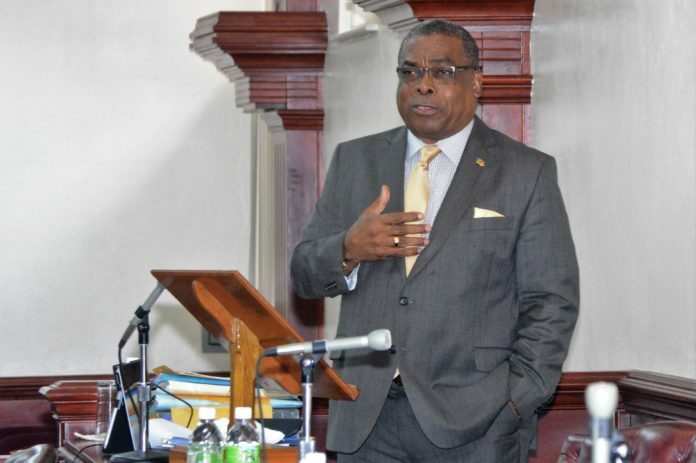 Basseterre, St. Kitts – During a sitting of National Assembly on Aug. 10, the minister of public infrastructure, the Honourable Ian Liburd, said the government of National Unity stands firm in its commitment to build a new Basseterre High School (BHS) and that it will remain responsible in all of its actions in this endeavour. Liburd referred to Page 41 of Team Unity’s manifesto’s commitment of building a new BHS. He said there were recurring issues within the former school and that they made a promise to address them. He reminded that the main issue being dealt with was the health and well-being of the staff and students. There were reports of fainting and skin rashes at the school, amongst other things, he said. The minister further stated that as a result of the number of cases of illness and “the suffering and the hardships of teachers and students at that institution,” the school was closed and a shift system was put in place. However, this proved to be unsuccessful, said the minister, noting that students often left the school at 8 p.m., in addition to other concerns from parents and teachers. This was not good for the safety of the children, said the minister. The shift system ended in August 2015 and the government has in place now a structure at Taylors Range, next to the Beach Allen Primary School, that houses 95 percent of the students while the new BHS is in the works. A steering committee called the St. Kitts-Nevis Water Experts Working Group was established to look at the suitability of building the school on the chosen site, said Liburd. The committee is being chaired by Director of Public Works Cromwell Williams, who is also a civil engineer and hydrogeologist. Also, on the committee is engineer and environmentalist Dr. Halla Sahely. Also brought onboard was another civil engineer and former water services manager, Athill Rawlins, who spent more than 20 years developing water in the country. The group also made recommendations to the cabinet, such as the monitoring and control of all waste water streams generated by the school, including solid and liquid waste. They also recommended that standard operating protocols for receiving storage and disposal of all chemicals are properly designed in case of spills. The group further recommended that the appropriate technology for waste water collection and treatment at the site be used. Liburd noted that the overall issues of water resources development and protection in St. Kitts and Nevis were considered.